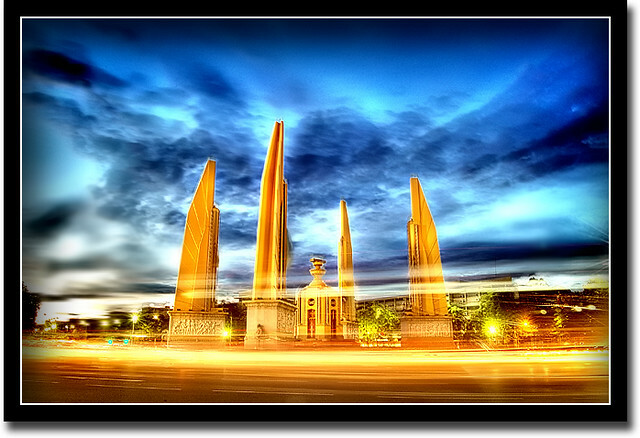 The Democracy Monument in Bangkok is an important historical landmark. Although it doesn’t look nearly as beautiful as in this beautifully digitally enhanced picture when you drive by it during the daytime. 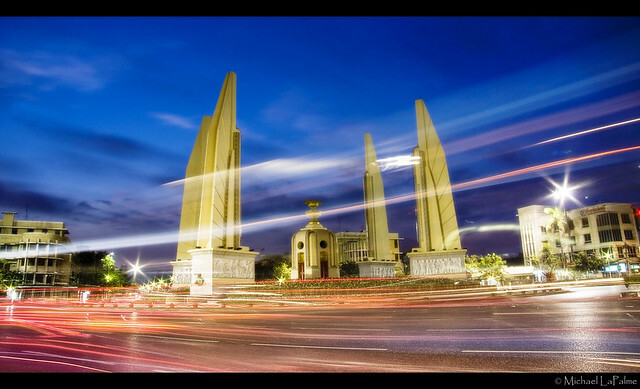 The Democracy Monument is on a major road, Thanon Ratchadamnoen, and cars drive around it all the time. It is just a short ten minute walk away from the famous Khaosan Road, Bangkok’s most popular district for backpackers. So it is a good place to stop by on a Bangkok sightseeing tour, because in close vicinity, there is also the Golden Mountain temple. Field Marshal Plaek Pibulsonggram (popularly known as Phibun), ordered the construction of this monument in 1939. It was built to remind people of the military coup that led to a constitutional monarchy in 1932. 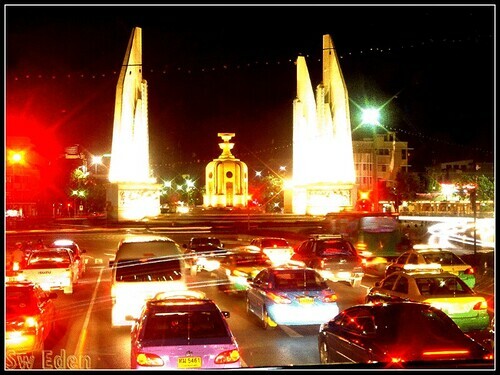 Phibun wanted to westernize Thailand, and the road on which the democracy monument is build was meant to resemble the Champs-Elysees in Paris – with the Democracy Monument as the Arc de Triomphe. This was not at all a popular decision – the normal people didn’t care to Westernize, and they surely did not care for resembling some street in Paris. Lots of local shopowners and residents were evicted from the area with 60 day notice. Hundreds of old trees were cut down to add additional lanes to the street to widen it. If you walk down there now, you will surely not find it a pleasant walk – too many cars, too much heat, and it’s all concrete. But military rulers often care more about symbols of power and prestige than about how their decisions affect the normal lives of their people. As you can see, in the center there is a round, bell-shapes structure. On top of it, you find two bowls, on which a box is placed. This box represents a palm-leaf manuscript box, in which the constitution of 1932 was put. 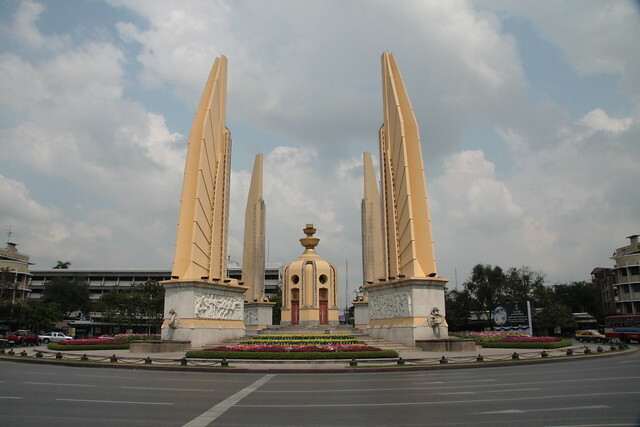 The bell-shaped structure, the turret, is three meters high – because the coup took place in the month of June, which, in the traditional Thai calendar, is the third month of the year. Around this bell-shaped structure, you can see four wings, each 24 meters high. (24, because the coup took place on June 24). Each of these wings represents one of the branches of the Thai armed forces that did the coup: the army, navy, air force and police. The reliefs you can see on the wings are essentially propaganda, depicting the armed forces as heroes who rule for the people. (Although history has shown that this is a rather unlikely scenario – the military rulers had a lot to gain personally from the coup). Mew Aphaiwong, an architect. He was a relative of a leading member of the Phibun regime. The relief sculptures around the base of the monument were created by Corrado Feroci, an Italian who had Thai citizenship and was in Thailand known under the name of Silpa Bhirasi. Even though it originally was just erected as a propaganda instrument by the Thai military regime in the 30’s, many decades later it became a place where demonstrations took place that were indeed democratic. Also, the place has a history of clashes between the military and the people. In 1973 mass student demonstrations took place here, and in 1992, many Thai people were killed who protested against General Suchinda Kraprayoon’s regime. In 2010, during the red shirt protests, several people got killed here too, including a foreign journalist who was reporting on the protests, probably shot by army snipers. This is good, and you’ve taken the care to be original. I don’t how many people just copy the text from wikipedia and paste it. Honestly, no credibility in that.